Joe has just given us a nice overview of the upcoming series; here, for a somewhat different perspective, is a report on what Tigers fans are thinking about right now, coming to you from a Michigan native who's currently wearing a Verlander shirt and sending Joe notes about Jeremy Bonderman's 2006 ALDS performance through the inter-office mail. 2. These playoffs could put the icing on one of the best streaks a GM in any sport has seen in some time. Dave Dombrowski is a guy unafraid of making big moves — and we're talking meaningful, team-changing moves, like trading two top prospects for Miguel Cabrera, not "let's offer the most obviously overhyped free agent of the off-season 150 percent of his market value" moves — and he's been quite active since last season ended in mediocrity. In the off-season, he re-signed the offensively mediocre and defensively spotty Jhonny Peralta to play shortstop; Peralta proceeded to turn in his best year hitting since 2005 along with some pretty okay-looking defense, if I'm reading this right. Dombrowski let Johnny Damon walk and then signed Victor Martinez to take his DH spot; Martinez hit 100 OPS points better than Damon this year and even caught 26 games. 3. How about that Alex Avila! A system-filler minor-league prospect, Avila became the Tigers' full-time catcher this year, pretty much by default — then hit nineteen home runs and knocked in 82 RBIs. If you don't know much about him, you probably will by the end of the series, because his dad is the Tigers' assistant GM, and will get shown on TV a lot. 4. We are less exasperated by our manager than usual. 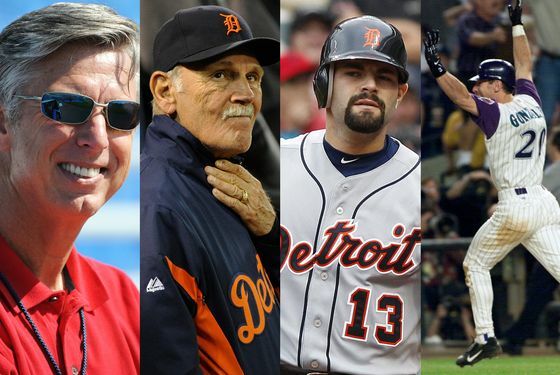 Jim Leyland has been the Tigers' best manager since Sparky Anderson, there's no doubt. He handles the press, he keeps the locker room in order — there's no drama in the LBC when Leyland's around. Of course, that just gives fans more time to focus on his more exasperating qualities, like his insane insistence on batting his best hitters in the bottom half of the lineup, just because that's where they happened to start the season, or his maddeningly stubborn loyalty to veteran players who are fourteen years past their prime and have, like, developed advanced leprosy. This year Leyland's still pulling lineup shenanigans — guys with .600 OPSs still get a lot of at-bats in the second spot — but he's finally faced facts when it comes to veteran cronies like Magglio Ordonez and Brandon Inge. Inge is now a defensive replacement for Betemit, and while Ordonez still plays some, he has ceded a lot of time to less-gimpy youngsters. 5. The Yankees' recent record of playoff chokery is overwhelming. We've talked with some pretty confident Yankees fans this week, and don't really get it. We beat you in the season series. We went 20-6 in September. There is no reason you should not have had at least five championships since 2000. We know you don't go to bed at night thinking, "Alex Rodriguez, Mark Teixeira ... those are just two guys with their heads on straight who I always trust under pressure. And thank God Freddy Garcia is going in a potentially crucial Game Three on the road." The Tigers' biggest weakness is the back end of its starting staff and the middle-relief section of its bullpen. And those are the two least-important factors in a five-game series. Seriously, guys. You should start mentally preparing yourself for this again. Detroit is READY for you. Let's get it on!